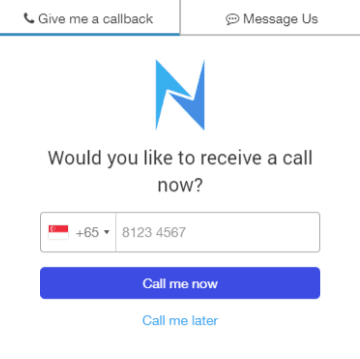 Why we created Novocall and why you need callback automation. Yes, telephony is still one of the most important sales channel when it comes to communicating to your customers. Relationship building and having a personal touch is still the best way to close a sale. At the end of the day, people crave for connection. However, there’s always a huge disjoint between the online to the offline and a need to bridge this gap. That’s why we created Novocall—a callback automation platform that helps you capture new interested web visitors and give them a call, bridging the gap between online to offline. You need to hear this: A website is not enough. You’ve built a beautiful website, with amazing copy-writing, fast response time and gorgeous graphics. Your visitors are impressed and they want to contact you to find out more. They send your sales rep an email. Your sales rep takes a couple mins to an hour to reply. The customer asks another question. Even if it’s on live chat, it’s still a disjointed customer experience. That’s why we decided to focus on the things that matter – no more communication barriers between visitors and sales reps.
With Novocall, your visitors can request for an instant callback within seconds upon submitting their phone numbers. Gone are the days of waiting on the line or pressing numbers on a voice menu. Lastly, we want you to capture prospects that are on-the-fence. A website is like a physical store. People come in to browse, and if they’re interested, they ask you or buy something. But the key difference is that in a store, your sales rep knows when someone is interested and takes action, while a website can’t. That’s why Novocall allows you to detect interested visitors from your website. Once someone is interested based on their web behaviour, our widget triggers, asking them for a call. It’s like a virtual sales reps in your website! Novocall widget triggered after a visitor views most of the website. When we look at the communications between website visitors and companies, we realized that there was a gap. Despite live chat and chat bots being on the rise, there’s a whole area that’s not covered. B2B businesses and service-based businesses who needs to talk to a sales rep, fast. Business owners – they want to engage visitors to increase web conversions and sales. Sales and support teams – they want to automate their call requests and save time manually scheduling calls. Marketing teams & Marketing Agencies – they want to attribute calls from marketing campaigns, and they want to increase overall ROI from their marketing campaigns. When a lead or customer clicks on the callback widget, they’ll be prompted for an instant callback by inputting their phone number. 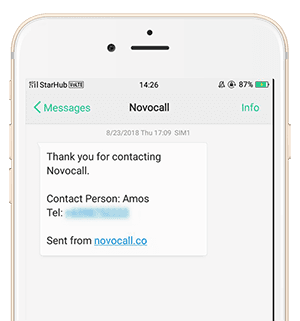 Once customer’s phone number is entered, Novocall rings your company call reps.
Once a call rep answers, Novocall will call your customer. This happens in a span of 30 seconds. So, what can I exactly do with Novocall besides connecting with my leads? Capture more leads, and convert them. Provide visitors with a free instant callback to a sales rep, who can then close the sales easily. See how it works. After working hours? Automatically schedule calls. Capture after-hour leads by automatically scheduling calls during your working hours, or automate call scheduling on emails and through SMS. Click here to learn more about call scheduling. See where your callers are coming from. Gain context before your calls by seeing the exact web page that your customers come from. Thank you for reading about how we came up with Novocall. It’s great telling our story, and I hope you’ve found what you need.